A rash of arsons decimates the city, especially the gang-ravaged south side. Newly home from Iraq and still reeling from his “other than honorable discharge,” Jason Palmer wants nothing to do with the violence in his neighborhood. But when his eight-year-old nephew witnesses a brutal murder, Jason isn’t just the boy’s only remaining family — he’s all that stands between an innocent child and the killers who will stop at nothing to find him. Now, one damaged man must find a way to become a soldier again…or lose everything worth fighting for. 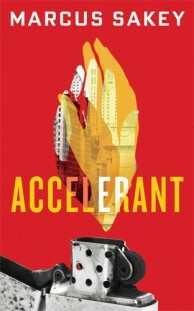 Hailed as “nothing short of brilliant” by the Chicago Tribune, Accelerant is a blistering thriller of love, greed, redemption, and the costs of our deepest bonds.